This is a powerful lesson which really gives students pause for thought. The class start with a what's behind the squares activity which reveals a female Soviet sniper and which is designed to stimulate discussion about the nature of war. 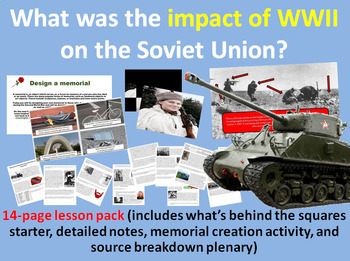 The class then read through an incredibly detailed set of notes before beginning a design-a-memorial task for which they are expected to include precise historical detail. The lesson concludes with a powerful piece of source analysis which invites further informed comment on the nature of fighting on the Eastern Front.